A Native Instruments Stems master can be ordered as an extra option along with Stem mastering or multitrack mixing/mastering. When you order this option along with your regular online mastering, you must provide us with at least 4 stereo audio files (stems/separations) of your track. Each audio file contains some single or combined elements of your mix. With stem files, you give the DJ a unique tool to play your music in a creative way. What is a Native Instruments Stems master? Native Instruments Stems master is a new format of audio file that enables the DJ to be more creative during his performance. By using Native Instruments Stems, it is possible to split the track into 4 individual musical elements. During a live set, a DJ can turn these musical elements on and off separately. This will result in numerous possibilities for the DJ, like using the vocals of one song and the beats of another. A stem file consists of 4 stereo stem-tracks and a 5th track for the stereo downmix. Each track consists of one or more combined elements of a song. The stem file is saved in the .mp4 format. This means one mp4 holds the 4 stems and a stereo master of the song. The stereo master inside the mp4 can be played with players that can handle the standard mp4 specs such as I-Tunes. Music in the stems format is released on popular download platforms like Beatport and Juno. Currently, stem files are sold in a higher price range than stereo files. This way, they generate more income for labels and music producers. To mix with Stems, a hardware controller can be used for ‘hands on’ control. While the track is playing, you can lower or raise the volume of the 4 musical elements. It’s also possible to play a track without the melody. Or without the drums for instance. By bringing different elements in and out of the mix you can create your own mash ups live. Therefore, mixing with Native Instruments Stems is becoming more popular. It’s expected that more software and hardware will be available on the market that will support the playback of mp4 stem files. A Native Instruments Stems master can hold up to 4 separate (stereo) elements of your song. Bass, drums, vocals and melody is a common format for a song with vocals. For instrumental songs, you can use the vocal stem for other elements of your song. When you are interested, we ask you to send us at least the above-mentioned elements. However, you can decide to send us some more. This will benefit the mastering procedure. The ‘Rest of the mix’ stem file is a .wav that holds the elements of your track that are not included in the other stems. Including this file, you will have 7 stem files of your mix. Contact us if you need advice in what kind of submixes we need from your mix. Please also include a download link to your track so we can take a listen. If possible, send us a SoundCloud link. After mastering, we will mix the 7 stems back to 4 stems. Decide which stems you want to be able to play separately in the mp4 stem file. Also, consider sending more stems for mastering reasons. To create one stem, just render your project with the desired instrument in solo or mute the tracks that you don’t want to hear in the stem that you are creating. Bypass limiting and compression plugins that you have used on your master bus. Disable noise shaping and dithering. Make sure the output does not clip after disabling the plugins on the master bus. Peak levels between -12 and -0,1dB are fine. Bounce your stems as .wav or .aiff at a minimum resolution of 16 bit/44.1khz. After you have created all the stems, check if nothing went wrong. Do this by importing the stems in your DAW. Hit playback and listen if you still hear your complete mix without errors. Native Instruments Stems can be ordered as an option for Stem mastering and multi-track mixing/mastering using our web interface. In step 3 of the web interface, you must mark the Stem mastering or multi track mixing/mastering option. Don’t forget to mention how many stems or tracks your songs has. 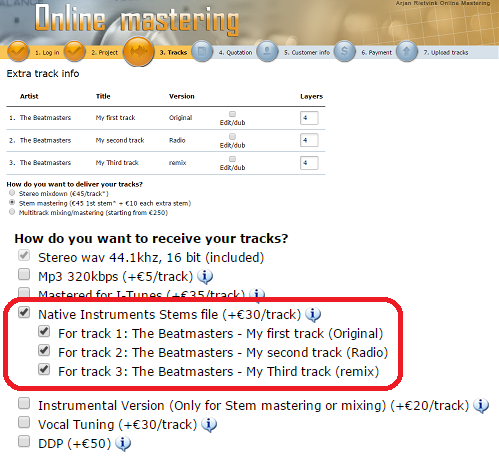 You can check and uncheck the track numbers you want to order the Native Instruments Stems mastering option for. Whatever option you choose, you will always receive a mastered stereo version of your track in addition to the Stems master. In the next step, you will get a quotation for your project. Your songs are in the hands of mastering engineers that work for the bigger labels of this planet. See our discography and credentials. On top of that, we work in an acoustically optimized environment with high precision loudspeaker systems that are specially designed and built for us. We started working as mastering engineers in the nineties, so we have lots of experience in mastering various types of music. However, we will always need some information from you to get the result you like. Inform us on the kind of sound you are looking for or what you feel is missing in the sound of your track. When uploading your tracks for Stem mastering, you can place comments using our web interface. After uploading and during the mastering you can also send us a message using the private online forum. The mastering engineer will read these messages during the mastering. If we have questions or comments, we will place them on this forum too. Upload reference tracks along with the track you want us to master. A reference track can be a version of the track mastered by you. You can also send us a different track that we can use as an example for your master. By default, you can send a total of 3 reference tracks. Use high quality sounds/samples/synths/recordings. The better your mix sounds before mastering, the better the result will be after the mastering. Listen to your mix on a variety of sound systems. Make sure you properly prepare your song for mastering. Would you like to get more information on Native Instruments Stems mastering? Contact us by sending an email to contact@digitalmastering.nl or fill in the contact form. We will return to you as soon as possible.